When you want to buy an awning or canopy for your caravan, it’s important to know what the right Walker size of your caravan is. Walker has measured and collected some measurements in a database. Our database consists of caravans with year of construction from 2000 to 2018. Choose your brand, year of manufacture, model and type and you will immediately see the right Walker size of your awning for your caravan. When ordering, next to the Walker size, ALWAYS indicate your caravan’s brand / model / type / year of construction for additional control. If you doubt the size or if your caravan has a year of construction before the year 2000, we advise you to measure the caravan yourself. Is your size an ‘in-between-size’ within the size table? No problem! 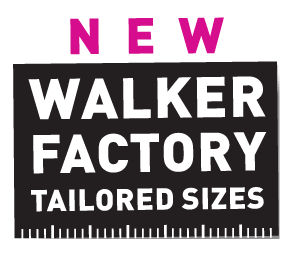 We manufacture the Walker factory tailored sizes. 1. The A-B-C measurement; this is exactly the fit of the Walker tent. 2. The width of the caravan at 185 cm height; this determines the width dimension of the front wall. ‘Higher’ caravans have a larger size but may require a narrower front wall; ‘Lower’ caravans have a smaller size but may require a wider front wall. 3. Height of the rail from the ground; With ‘lower’ caravans, the awning roof will be less deep and the standard roof will be a little too big. The roof is hanging! With higher caravans, the awning roof becomes deeper and the standard roof will be slightly too small. The roof is too tight! In both cases, the awning roof must be adapted. Walker has all this data of every type of caravan in a database and fits the roof for you at no extra cost! 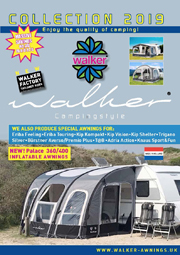 Walker Factory Tailored Sizes – always suitable for your caravan! It often happens that the size of your caravan is an ‘in-between-size’ within a standard size table. In that case your awning is actually too big or too small and the fit of your awning will not be optimal. There is a lot of uncertainty about what is now the correct awning size of the caravan. Walker is very clear about this! NEVER follow the factory size indicated by the caravan manufacturer! Each brand has its own sizes! For a Walker tent, the WALKER SIZE applies! You can find your right Walker size on this Walker website. Choose your brand, year of manufacture, model and type and you will immediately see the right Walker size of your awning for your caravan! 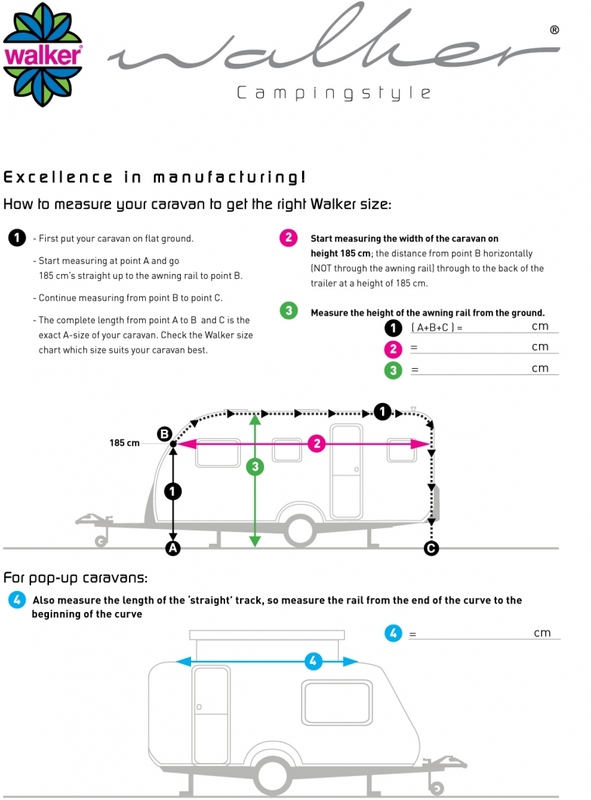 If you doubt the size or if your caravan has a year of construction before the year 2000, we advise you to measure the caravan yourself ‘Walker way’; Download here. Now you have the right Walker size!